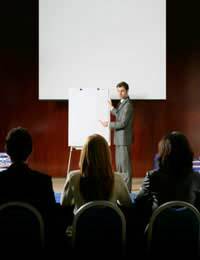 As we pointed out in our article on the use of computer presentations in business speeches, it's very rare to see a business speech that doesn't have an accompanying computer presentation on a projector or large screen. But there are techniques used in effective business speeches that cannot be easily replicated using a computer, so there's still scope for non-computer presentation tools. Some business speakers refuse to use computer presentations because they believe that they detract from the speech they are making. Although this does still happen, it is getting less and less common. It's more likely that a business speaker will use non-computer presentation tools or visual aids alongside a computer presentation. It's when a speaker wants interaction with the audience that the computer presentation often falls down. Simple tools like the flip-chart and whiteboard then come into play. For example, speakers will often ask for suggestions from the audience to make them think, or purely to keep them interested and engaged, and they can be very quickly written on a flip chart or whiteboard. Although there are computer tools that allow a speaker to write things on the fly and appear on the overhead screen, they aren't intuitive and many require the presentation to be minimised. This interrupts the smooth flow of a business speech and is frankly unnecessary if there's a pen to hand. A whiteboard can therefore be very useful, for example for writing up comments from the audience or new ideas that come up. Many business speakers use a whiteboard to write down questions that they are asked that they don't want to answer immediately. Then later on, they can check to see if the question was answered in the course of the presentation or not. The benefit of the whiteboard is that things written up on it can stay there throughout the speech, at least until there's no more space. This is when the flip-chart comes into its own. Although a flip chart usually has less space to write on than a whiteboard, the sheets can be torn off and stuck around the room, using blu-tac, sellotape or anything else that comes to hand. This means that they can remain as a point of reference throughout the rest of the business speech. The whiteboard and the flip chart aren't the only non computer presentation tools in use today but they are by far the most common. Other aids that can help get your message across are handouts, leaflets and other paper materials that people can take away with them. Be wary of giving out handouts at the beginning though, as people may be tempted to read ahead and skip over the thread of your argument. Overhead projectors are still in use by some business speakers, largely for the same reason as whiteboards and flip charts, you can draw on the transparencies on the fly to make a particular point. But make sure you use a non-permanent marker or you will have to print out the transparency again. The main point of this article is that an effective deliverer of business speeches will use the best presentation tools available to them. This often means using visual aids that aren't computerised rather than being a slave to the PC simply because it's there. Remember that the purpose of any business speech is to get the points across in the most effective way and whether or not you rely on a computer or ordinary visual aids is completely irrelevant.